All Traffic Solutions, the leader in cloud-based traffic management solutions for law enforcement, transportation and smart cities just released its latest white paper, Eight Reasons You Need Traffic Data and Analytics Now. The paper was written specifically for law enforcement agencies with limited resources and budget who are challenged with managing and reporting on their traffic safety programs. The white paper makes the case why police departments and other law enforcement agencies should adopt a data-driven strategy for their traffic management programs that is both centralized and cloud-based. 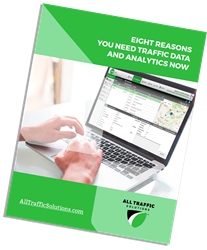 Eight Reasons You Need Traffic Data and Analytics Now white paper is available now as a free download. To learn more about TraffiCloudTM, All Traffic Solutions’ cloud-based ecosystem that allows users to remotely manage traffic devices as well as data from anywhere, go to http://www.alltrafficsolutions.com/solutions/trafficloud. Located outside Washington D.C. in Herndon, Virginia, All Traffic Solutions is consistently recognized as a leading innovator in the traffic safety industry for radar speed and variable message displays, imaging products and intelligent transportation systems, delivering groundbreaking levels of service and product capability. By integrating cloud technology into all of its products, All Traffic Solutions allows customers to manage all their equipment and data remotely through a browser, resulting in better traffic safety outcomes and initiatives related to vehicle-to-infrastructure solutions and smart cities. For more information, visit http://www.AllTrafficSolutions.com.